As might already be known, we are rather partial to a good matcha. When pictures of tall, very green drinks appeared on our Instagram feed, we had to check the source out for ourselves. 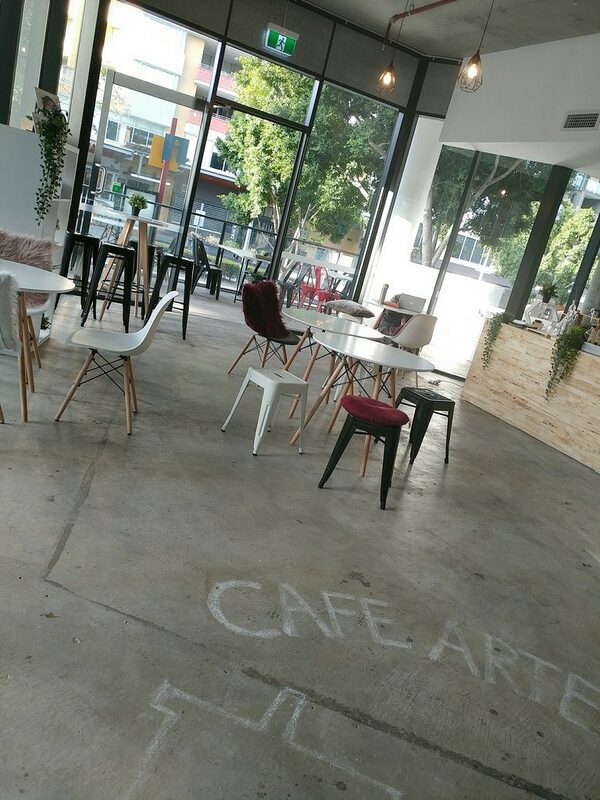 So it was that we followed the trail to Cafe Artease, in Kelvin Grove. 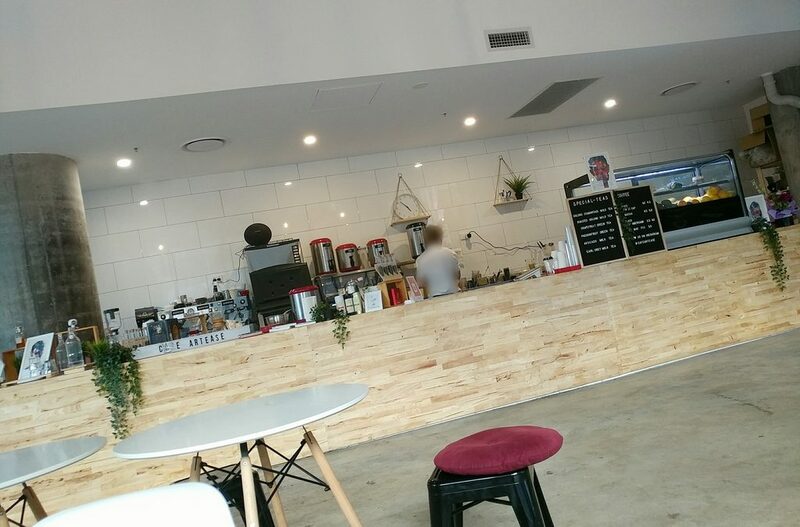 Cafe Artease is located in the Kelvin Grove Urban Village, interestingly enough, right next to a matcha destination we had already visited, B+C Lab Cafe. 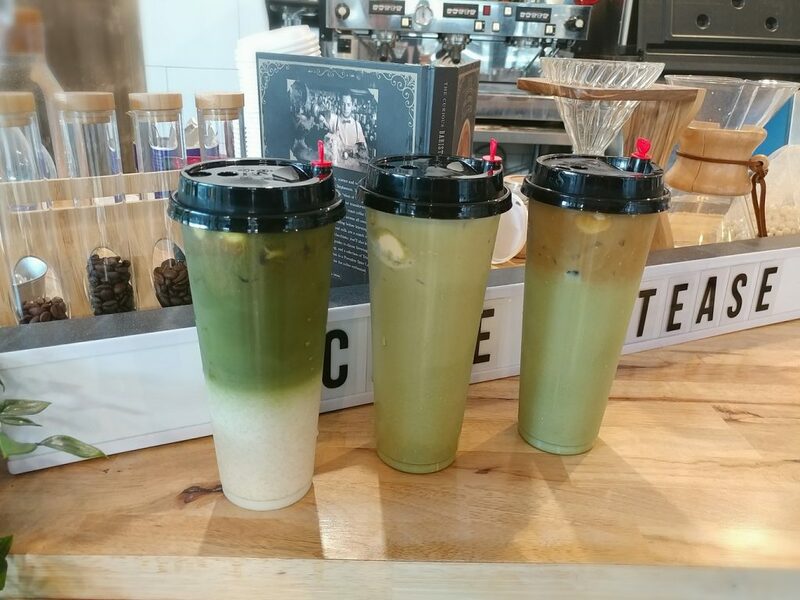 The student population in the area likely provides a ready supply of patrons who appreciate matcha, rather than looking at it askance, which might just be enough to sustain two matcha purveyors in close proximity. 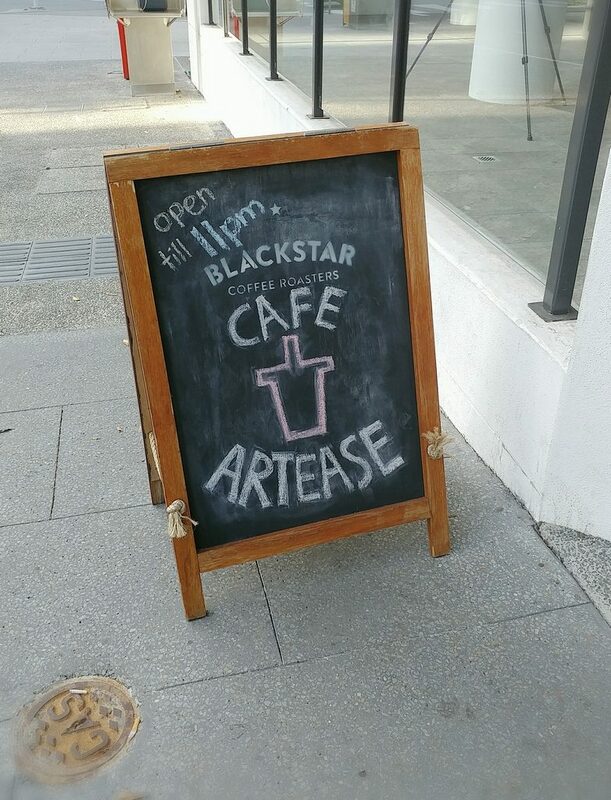 An A-frame board on the sidewalk with “Cafe Artease” written on it in chalk was the only signage we could see from the outside that indicated where it was. 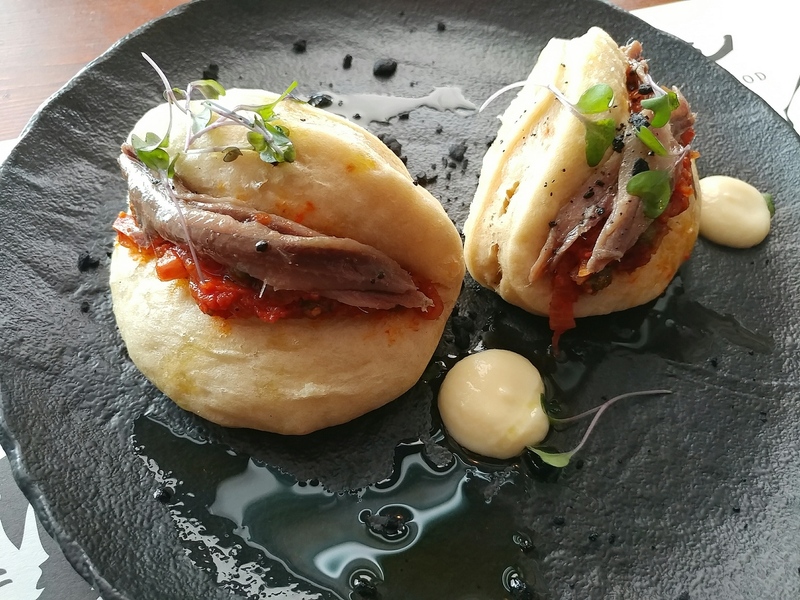 We walked up the stairs to the mezzanine level where the cafe was, and once through the glass doors, found ourselves in a minimalist, industrial-styled space. 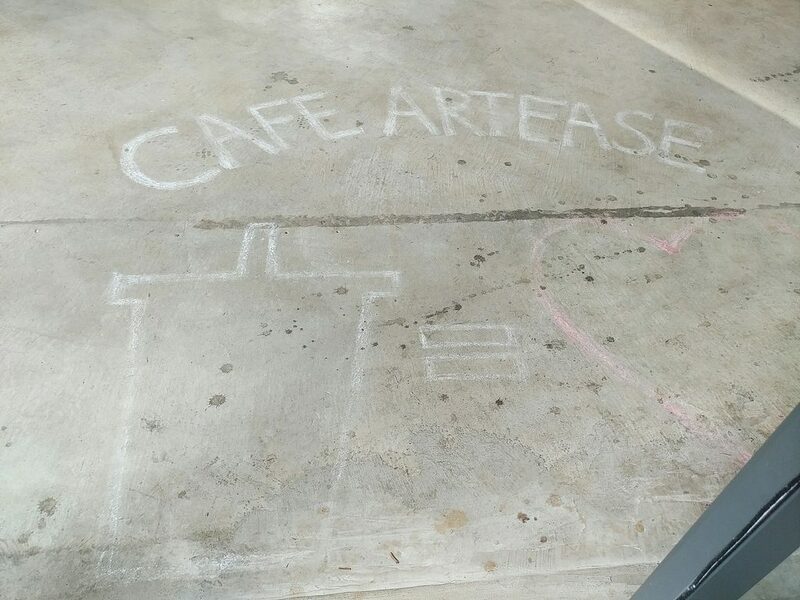 On the raw concrete floor at the entrance was, once again, “Cafe Artease” written in chalk, and chalk outline drawings showing a drink cup (presumably filled) equaling a love heart. The chalked floor at the entrance. Floor to ceiling glass panels going almost all the way around the cafe let daylight in. The high ceilings made it feel airy and spacious. Cage pendant lights hung down from above, providing more light in a warm hue, but maintaining the clean look. There were a few Eames-style tables and chairs to accommodate patrons, but rather than pack the space with seating, there was a good amount of room between the tables. 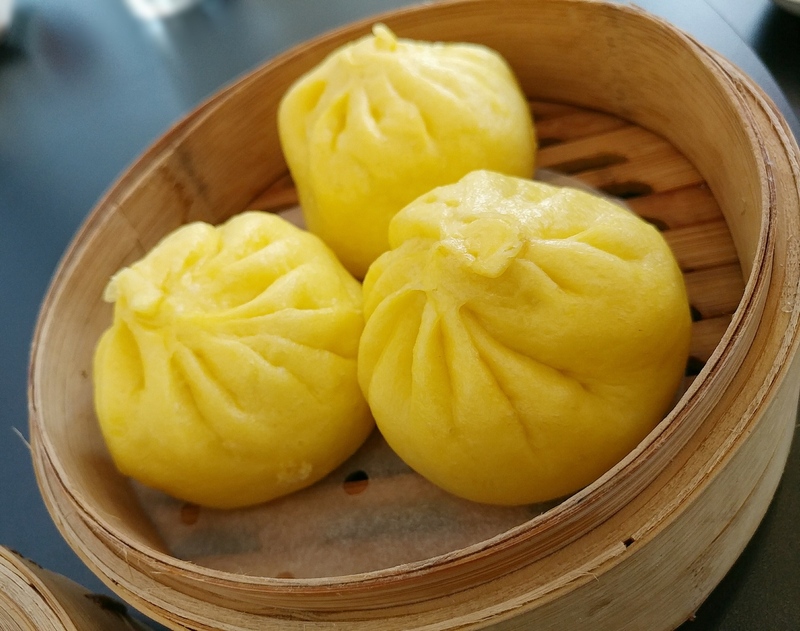 This gave one the feeling of being able to have personal space and private conversations there, unlike in many other eateries where you unintentionally become privy to discussions at adjacent tables. 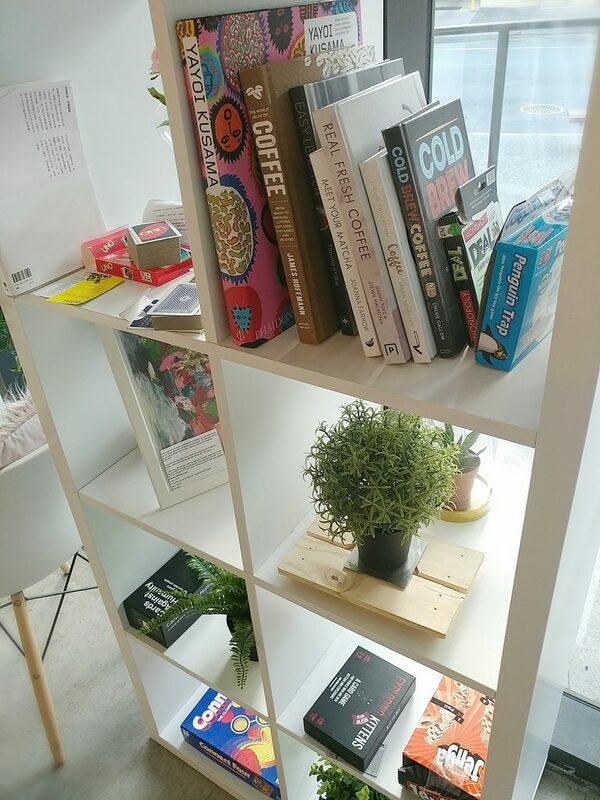 There was also a shelf with books relating to coffee and matcha, as well as contemporary games like Cards Against Humanity and Exploding Kittens, for patrons to entertain themselves with. Plenty of things to pass the time with. The service counter ran along most of one side of the cafe, the light-coloured wood brightening and softening what might otherwise be too starkly industrial a look. Pots of artificial greenery with long tendrils hanging down over the side of the counter as well as other small potted plants at the tables also helped temper it. In keeping with their intention to be a gallery as well as a cafe, works from local artists were displayed at the service counter and on top of the previously mentioned shelf. 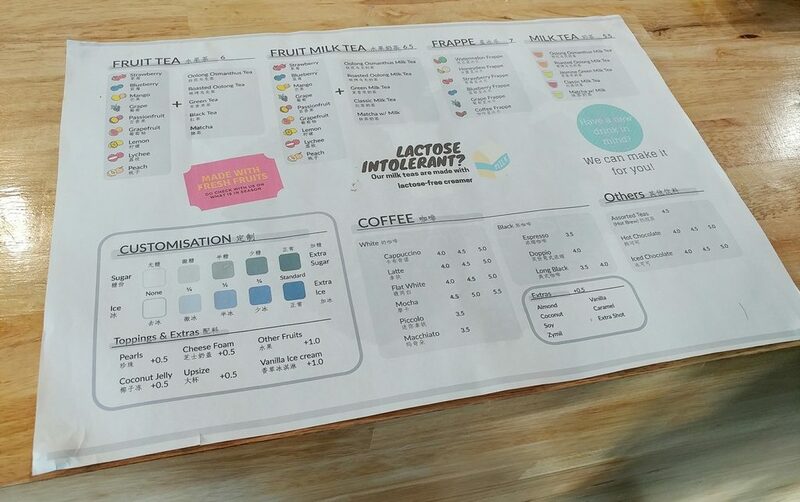 The menu of available drinks was printed on a sheet of paper that sat at the service counter. There were options divided into sections of Fruit teas, Fruit milk teas, Frappes, Milk teas, and Coffee. 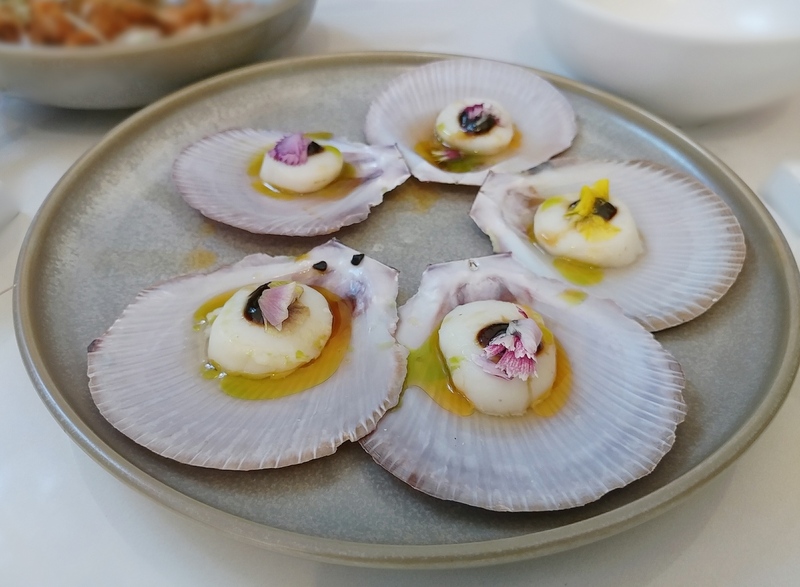 There were also customisation options once you had decided on what drink to have, of varying amounts of sugar and ice, and then additional toppings you could add, like pearls, coconut jelly, the increasingly popular cheese foam, and vanilla ice cream. The menu also stated that if you had a new drink in mind, they could make it for you, so the options could expand even further. 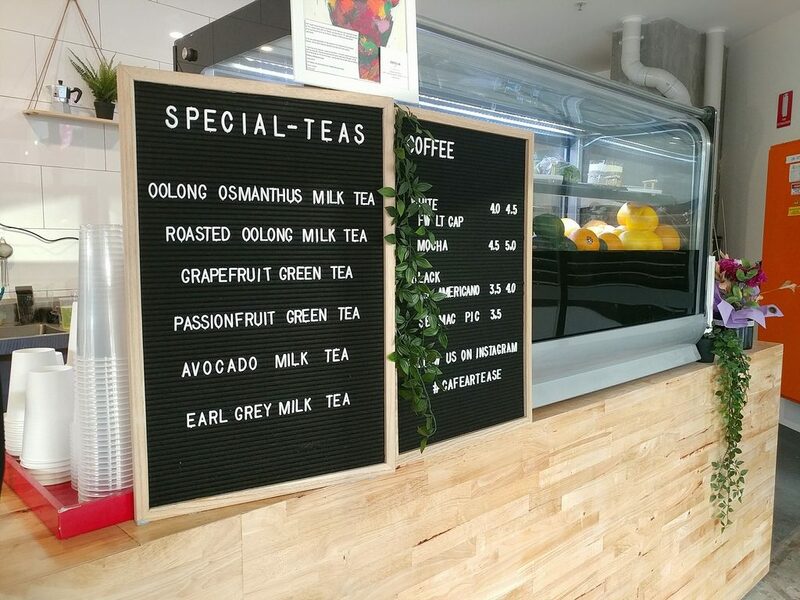 The menu also indicated that their fruit teas were made with fresh fruits, and that their milk teas are made with lactose-free creamer. 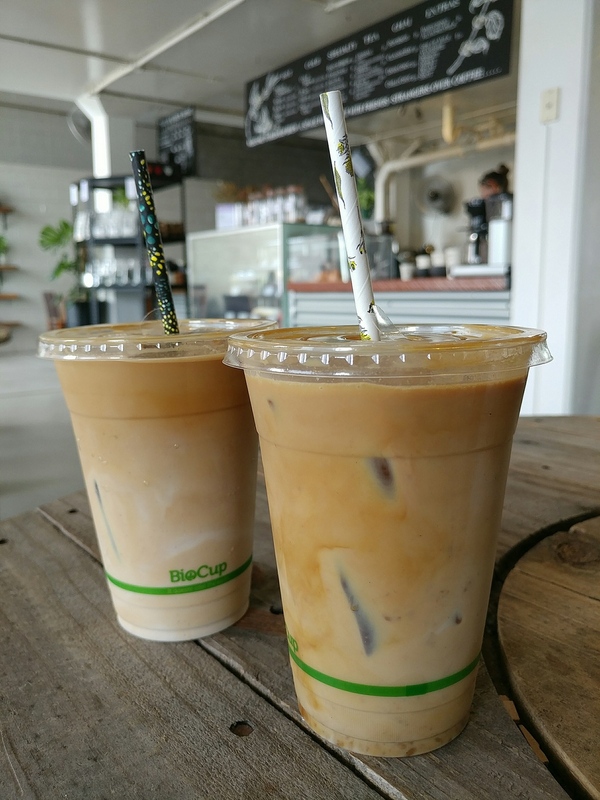 This, for the lactose-intolerant, is quite the game-changer, as they also offer a variety of non-dairy milks for their drinks, which means you don’t have to miss out on any of the drinks on the menu. Their menu, with a multitude of options. 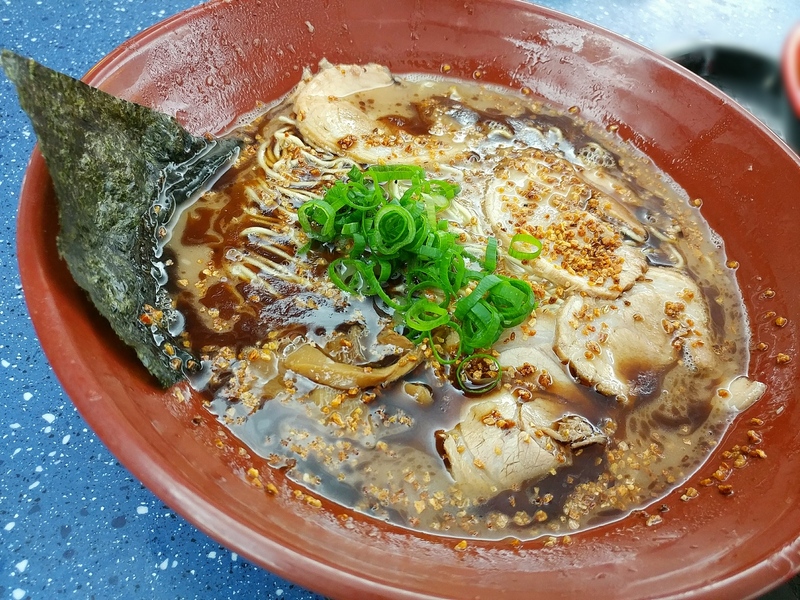 What we specifically went there to get was a drink that is not even on the printed menu (despite their many options), but a secret menu item that they will make if you ask them for it. The pictures that had piqued our interest were of the Dirty Matcha Float. It has matcha, coffee, and ice cream. You can also add pearls and coffee jelly to it, but we thought we would keep it a bit simpler that time. Amusingly (to us anyway), the staff asked if we wanted our drinks to look good or taste good. 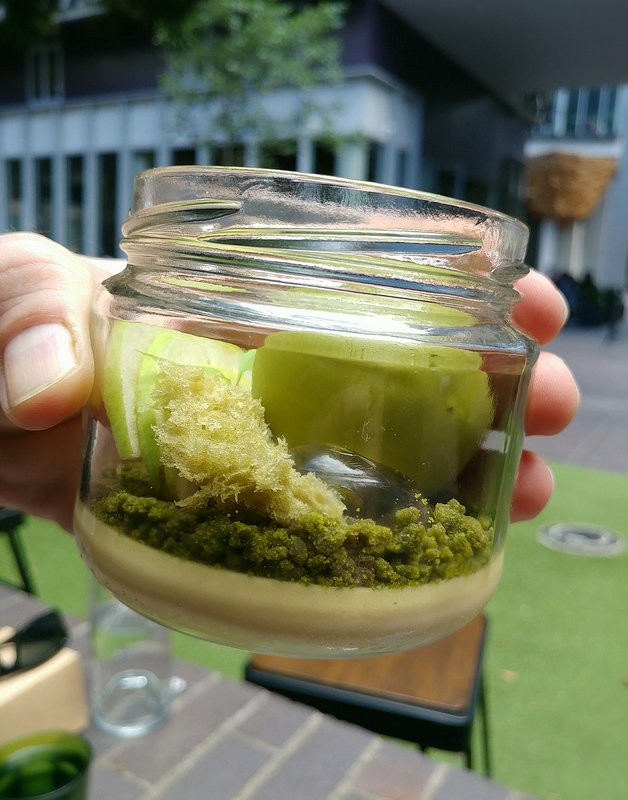 The difference is that they can layer the components of the drinks for a more interesting appearance (they know what is important to a certain proportion of their patrons), or mix them together for better flavour, but which unfortunately gives you a sort of browny-green drink. As we clarified, it is still not quite the same if one were to mix it oneself afterwards. Another menu..but still not the secret menu. 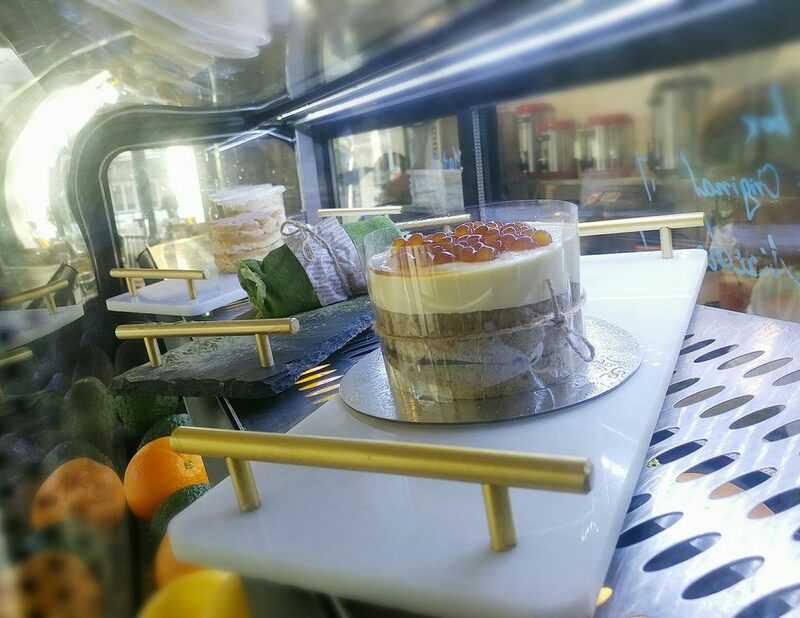 While waiting for our drinks to be made, we eyed the cakes in the glass cabinet, which included a matcha towel cake, effectively a cake made of matcha crepes, cream, and matcha cream. A different format of crepe cake.. We were tempted to try some of their cakes as well, but unfortunately were on the way elsewhere on a deadline, so couldn’t spare the time this time. Cakes in the cabinet, and fresh fruits they use for some of their teas. The drinks came out in toweringly tall cups (we had asked for them to be done as takeaways as we had to get going on to our next destination), with cute little heart shaped plugs over the mouthpieces so that they wouldn’t spill. We had asked for two of them to be layered, and one mixed, to be able to try to balance our priorities of good pictures and delicious drinks. 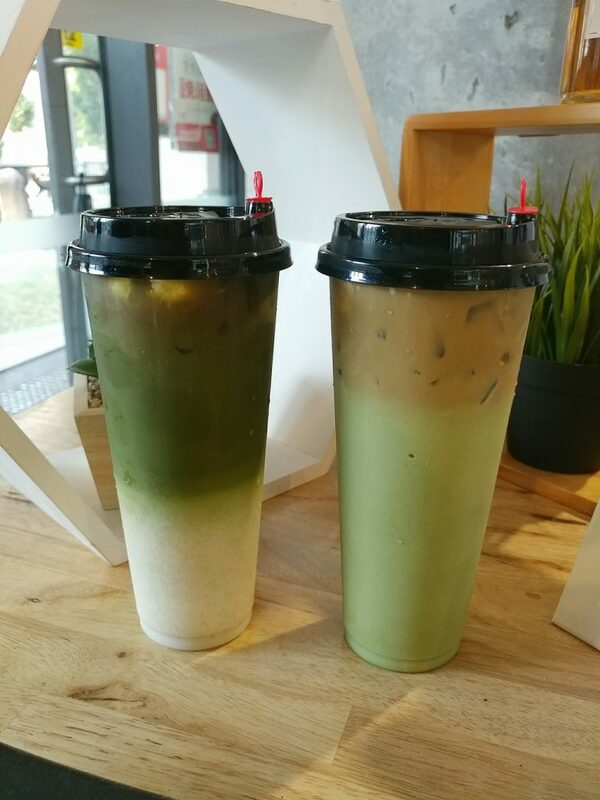 Interestingly, the layered Dirty Matcha Float done on soy milk looked different from the layered Dirty Matcha Float done on regular dairy milk. The milks must have different densities that interacted with the other components in a dissimilar way. It would indeed have made for much less interesting pictures if we had had them all mixed instead. 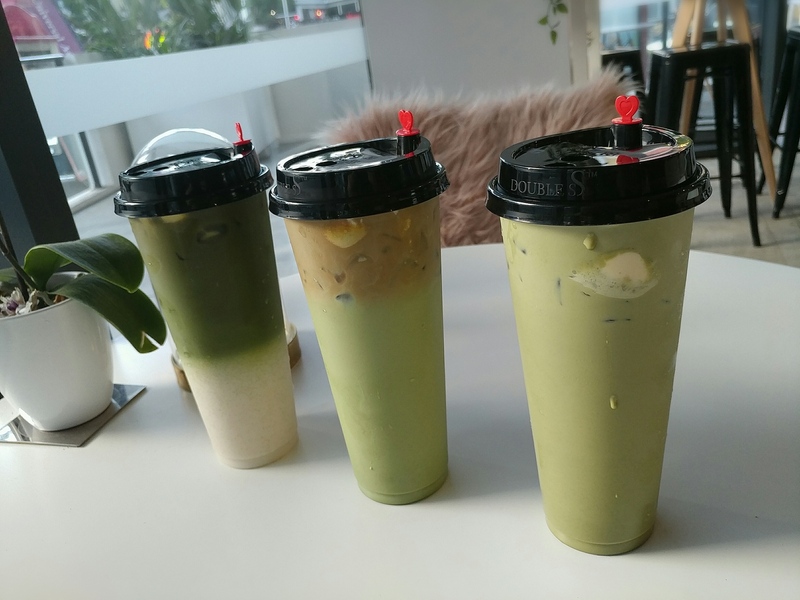 Our Dirty Matcha Floats in a row on the table. Soy unmixed version on the left, regular unmixed version in the middle, and regular mixed version on the right. We did indeed find that mixing them properly was a challenge, as it took some effort to get the coffee layer right on top evenly mixed through down to the bottom, and similarly, the bottom layer was sweeter until thoroughly churned through. The cups were well sealed, so the vigorous stirring did not result in spillage, but it did take concerted effort (particularly in a moving vehicle). We would indeed be inclined to agree, if photographing your food is not key to you, have them mix it through for you instead. 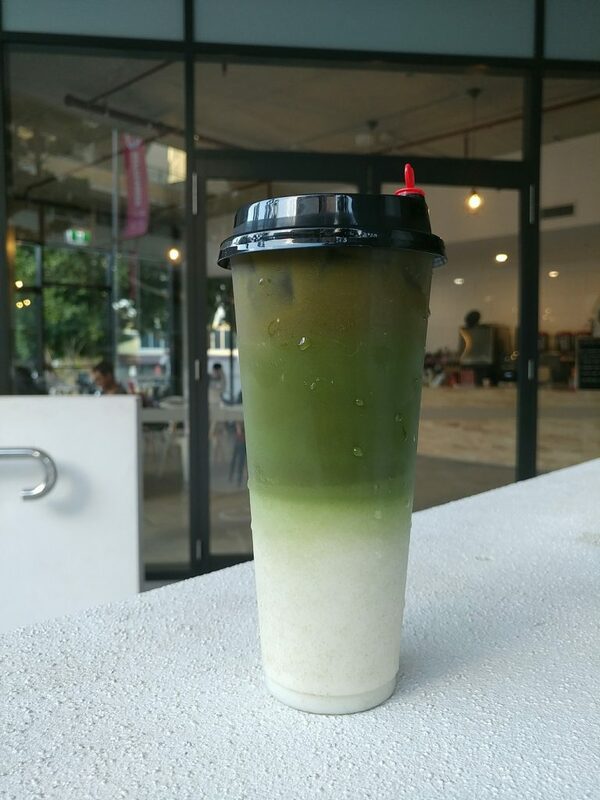 The Dirty Matcha Floats with a different backdrop.. Importantly, when it came to actually drinking the drinks, when mixed, they had good strength of matcha flavour, without bitterness or sourness. That should not be surprising, as they state that they use premium Japanese matcha. The coffee added fruity notes, and more of a caffeine kick. The ice cream contributed sweetness to the mix. It was a good combination. If you like matcha, you will enjoy this. Perhaps next time we will try it with pearls and coffee jelly for textural interest. The Dirty Matcha Floats again. Properly green. A look at their teas. 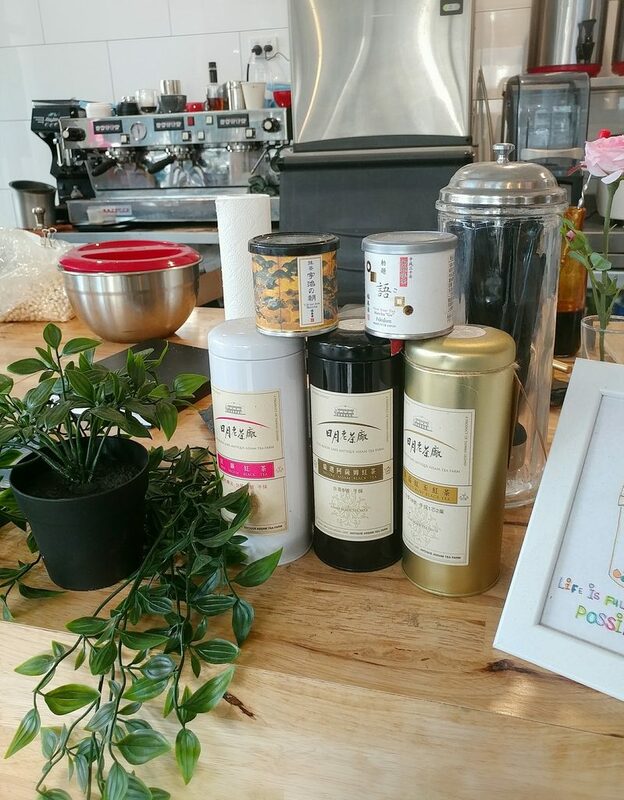 We would definitely rate Cafe Artease as a destination for a matcha fix. They have a wide range of other drinks as well, and they get extra approval for their catering for the lactose-intolerant. 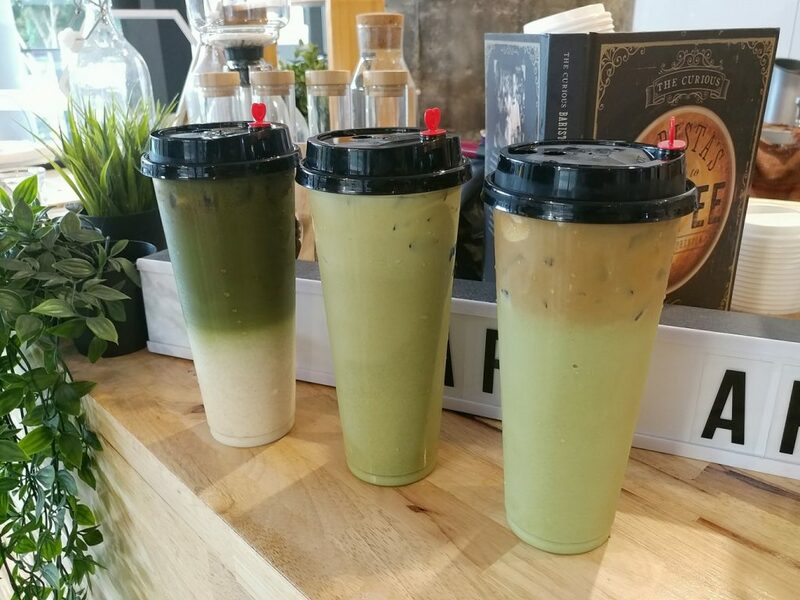 They are worth a visit, and you can do a matcha crawl in combination with B+C Lab Cafe next door. Unmixed matcha floats. You can just see the coffee layer above the matcha on the soy version on the left. Taking our drinks outside. Entrance to the cafe in the background..
Price point: Drinks $5.50 to $7 without additions ($0.50 to $1 for each topping). Value: Good, for good matcha.